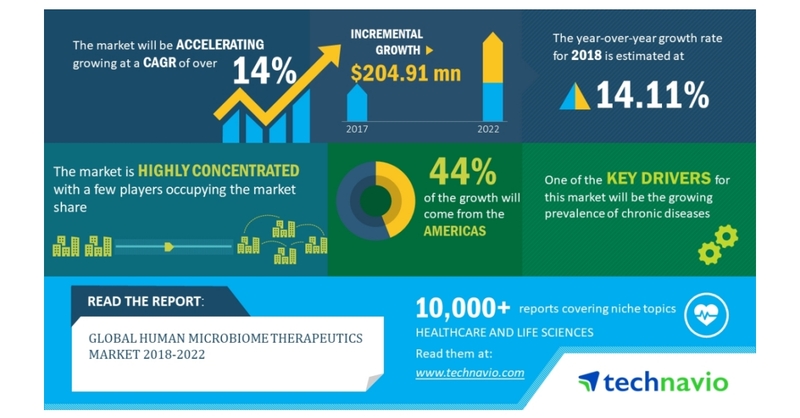 LONDON–(BUSINESS WIRE)–According to the latest market research report released by Technavio, the global human microbiome therapeutics market is expected to accelerate at a CAGR of almost 14% during the forecast period. The growing prevalence of chronic diseases is one of the key factors triggering the growth of the market. This research report titled ‘Global Human Microbiome Therapeutics Market 2018-2022’ provides an in-depth analysis of the market in terms of revenue and emerging market trends. It also includes an up-to-date analysis and forecasts for various market segments and all geographical regions. In 2017, the Americas accounted for 45% of the global market due to a substantial investment in the healthcare sector by economic giants such as the US. The increase in industry-academia collaboration is an emerging trend in the human microbiome therapeutics space. The key players in the global pharmaceutical drugs market are increasingly extending their support to academic institutions to support R&D of innovative products for diabetes care. Collaborations between companies and academic institutions enable the amalgamation of research expertise of academic institutions with marketing intelligence of pharmaceutical companies. Such collaborations also generate funds to conduct trial studies. The increase in public-private partnerships, especially in the developing countries fuel the development of novel therapeutics such as human microbiome therapeutics.